I've been thinking a lot lately about change. Change can be good (seasons, marriage, new children) and change can be difficult (divorce, death), but either way...a lot of times it's just hard, isn't it? It's tough to adjust and it's tough when consistency and everything you know simply flies out the window. I've realized that my attitude towards change is usually negative. It's typically wrapped around fear and doubt and frustration and just a sense of insecurity...and if I'm super honest with myself I'd say that I hate that. If I dig even deeper into my soul, I know that God is yearning for me to stop fearing change and stop doubting His goodness in the midst of it. Even if changes in your life are going on that are GOOD and EXCITING and WELL ACCEPTED, it can still be a bit stressful and tiring. When changes in our lives our HARD and BRUTAL and are absolutely ROCKING our foundation, it's even more-so. But we can rest in the fact that our God never changes and that's one aspect of my life that I can always rely on. He's the same. He'll never change. His never-ending grace, His everlasting love, and His abiding goodness, His boundless mercy and His endless sovereignty will NEVER fail. There's nothing to fear. Not even the most difficult of circumstances or changes. Be strong and courageous. 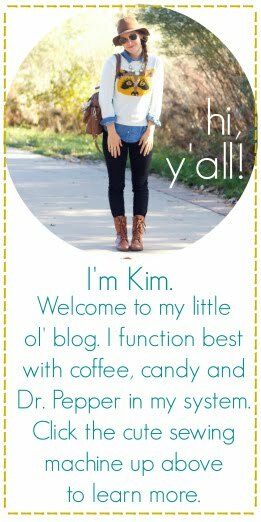 I adore that you're not afraid to talk about god on your blog. And you're so right, being courageous is what god wants for us. Living in fear and doubt will never do us any good. So right. Thank you so much for speaking about this. I'm at a MASSIVE changing point in my life (getting married, house hunting, thinking of changing jobs, applying for a Post Grad...) and it's so easy to get stressed instead of remembering to pray for wisdom and be content in God's promise to never forsake us. I understand. I had a lot of change in my first few years of marriage. Eventually constant change becomes your normal, and then lack of change becomes the hardest thing! :) I LOVE though that in every season God is the one constant. I needed this today. And I wrote each of those verses into my planner for the week so that I may be reminded. Thank you, Kim! This is perfect timing. Everything has changed for me lately - and it's all good. But you're right, it's tiring. God keeps sending me those verses in Dueteronomy and Joshua. I love how they keep showing up wherever I turn. He is so faithful. These are some of my favorite verses! Especially the one from the book of James. Thanks for the reminder. One of my greatest weaknesses is letting my fears control me. Oh lady, talk about timely! I guess a lot of us are going through change, and it can be challenging to see the good even in an obviously positive shift. This is wonderful! And so happy you are sharing :) It's always great to see fellow Christians in the blogging world! This is a great post and I so needed to hear it. I've been having a hard time adjusting to a new season in my life. i hate hate hate hate change. and i know that it's bad for me to hate it so much. thanks for the reminder of God's UNCHANGING goodness. Needed this sweet reminder of His steadiness today! Thank you, So glad He is our one that never changes! I'm so glad I read this! It was very encouraging and a good reminder of who God is and that He will always be there no matter what. Thanks friend! I actually have kind of the opposite struggle... I often crave change.. And this causes me to struggle with being content with the present. But fear, insecurity, doubt and frustration all factor into this struggle as well.